Making SUVs Run Cleaner, Farther on Biodiesel As gasoline prices climb, many motorists want better mileage without sacrificing power. That's where Johnathan Goodwin comes in. He converts Hummers, Cadillac Escalades and other large SUVs to run on biodiesel, making the huge vehicles run more efficiently and cutting their emissions. 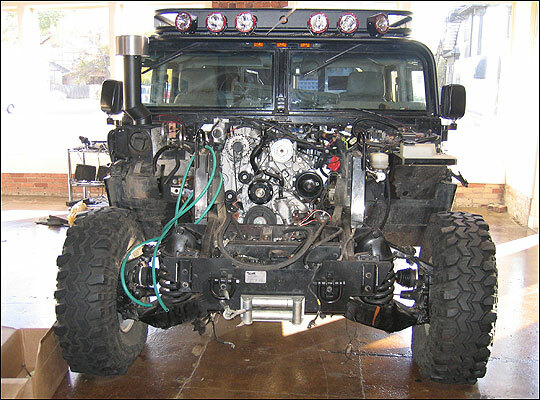 An H1 Hummer is being converted to run on biodiesel or conventional diesel at Johnathan Goodwin's shop in Wichita, Kan. Goodwin's conversions can double the horsepower of the Hummer while boosting fuel economy from 8 miles per gallon to 22 mpg. As crude prices push toward $100 a barrel and gasoline in many parts of the country is selling at more than $3 a gallon, some SUV owners are looking for ways to improve their fuel economy. Johnathan Goodwin in Wichita, Kan., says he has the answer. 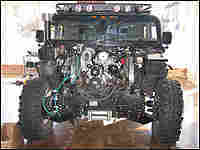 Goodwin is converting Hummers, Escalades and other large SUVs to run on biodiesel. While the conversions are costly, he's able to double the fuel efficiency of the vehicles, boost their power and dramatically cut emissions.